© 2002, © 2018 by Paul Freeman. Revised 9/30/18. Cuero Field, as depicted on the April 1942 San Antonio Sectional Chart (courtesy of Ron Plante). as no airfield at the site was listed in the Airport Directory Company's 1937 Airports Directory (courtesy of Bob Rambo). Cuero Field was approved by the government as a primary training facility in January 1941 & established on 2/6/41. which conducted a contract flying school for military aviators. “Clyde Brayton [was a] veteran pilot whose first licenses (1926-1931) were signed by air pioneer Orville Wright. 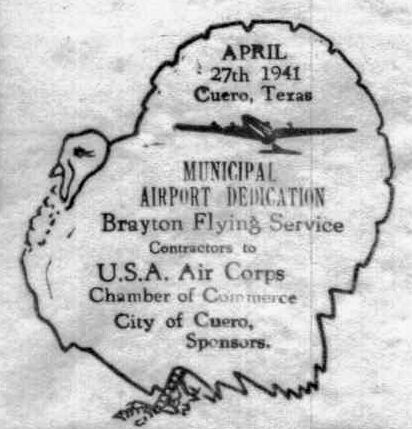 Cuero provided land, Brayton put in facilities & enrolled the first class in March 1941. 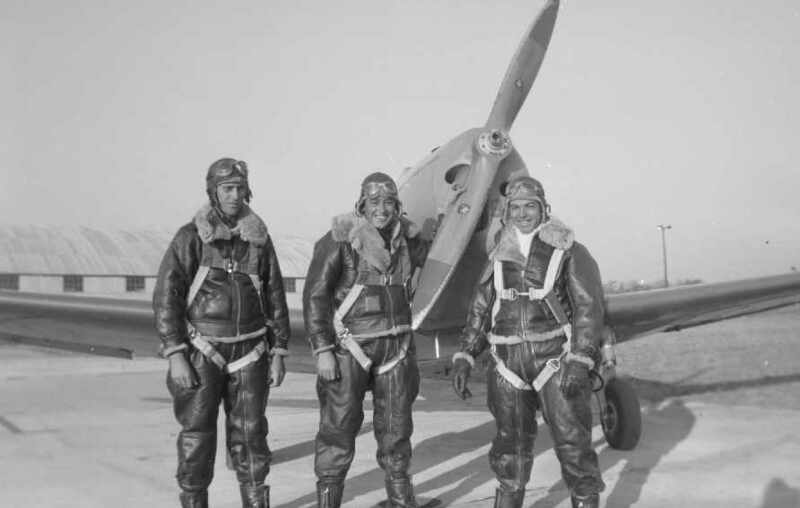 A staff of 550 civilians & 100 military men trained 6,611 students who flew 335,000 hours. 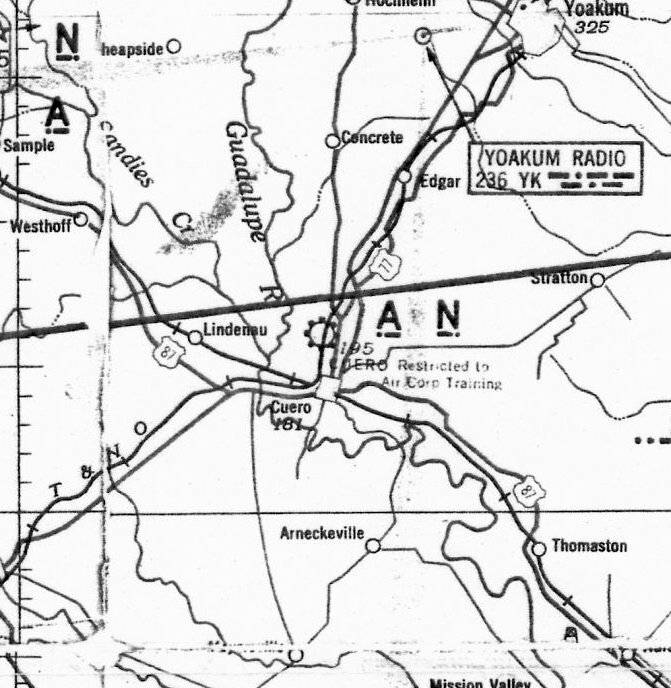 was on the April 1942 San Antonio Sectional Chart (courtesy of Ron Plante). It noted Cuero as being “Restricted to Air Corp Training”. 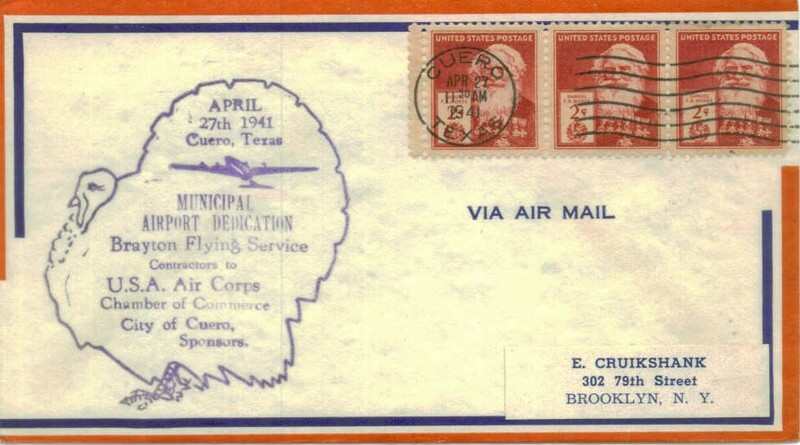 A postmark commemorated the 4/27/41 Municipal Airport Dedication of Brayton Flying Service. in a November 1941 advertisement for the Waco Aircraft Company. in front of a Fairchild PT-19 at Cuero Field. though the army rigidly supervised the training. The 9 week course included classes in meteorology, navigation, aircraft identification, and aircraft engines. and 65 hours actual flying time. The school's capacity was 290 cadets. Thousands of pilots who graduated from Cuero Field went on to serve in WW2. An undated set of wings from Brayton Flying Service (courtesy of Ros King). The Brayton Flying Service School payroll brought about $145,000 a month into Cuero's economy. and Majors Shepler W. Fitzgerald & Timothy F. O'Keefe. 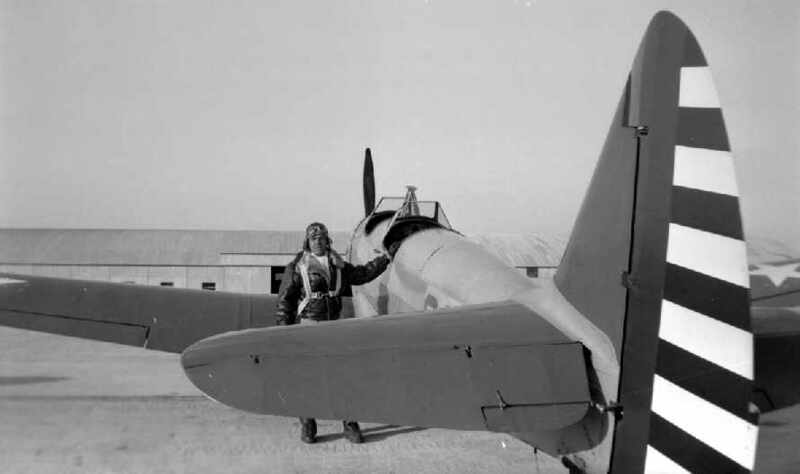 A circa 1942 photo (courtesy of Jim Rader) of Milton Tucker, of Cuero Field's Class 43-D, posing with a Fairchild PT-19. A circa 1942 photo (courtesy of Jim Rader) of Cuero Field's Hangar 1. 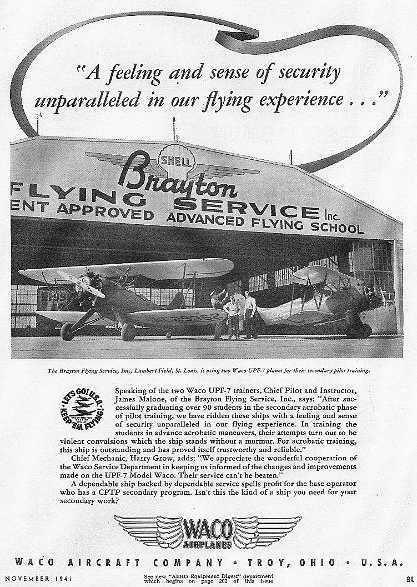 Brayton Flying Service was originally established in St. Louis in October of 1933. The Texas operation was organized in December 1940 & training began in March 1941.
which was an old ranch & abandoned rice field with no drainage at the time of construction. 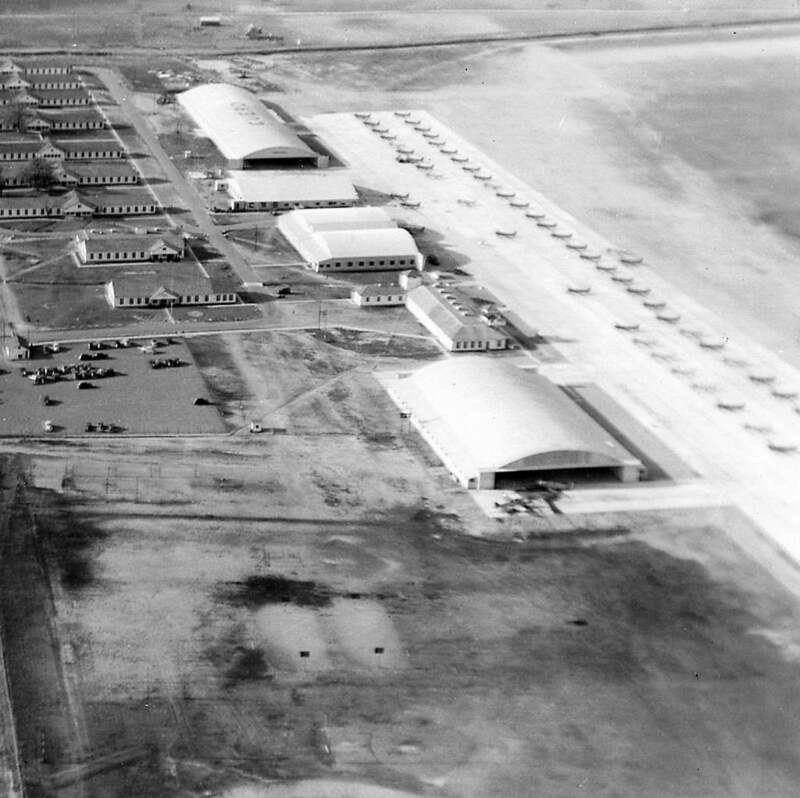 The main aerodrome covered 501 acres & had 4 hangars, 7 barracks, and 10 other buildings. There were 4 practice fields totaling an additional 800 acres. The school had a western motif & decor with cattle horns, spurs, Mexican decoration & furniture. All indications are that the runways were grass. The 1943 San Antonio Sectional Chart (courtesy of Chris Kennedy) depicted Cuero as a commercial/municipal field. 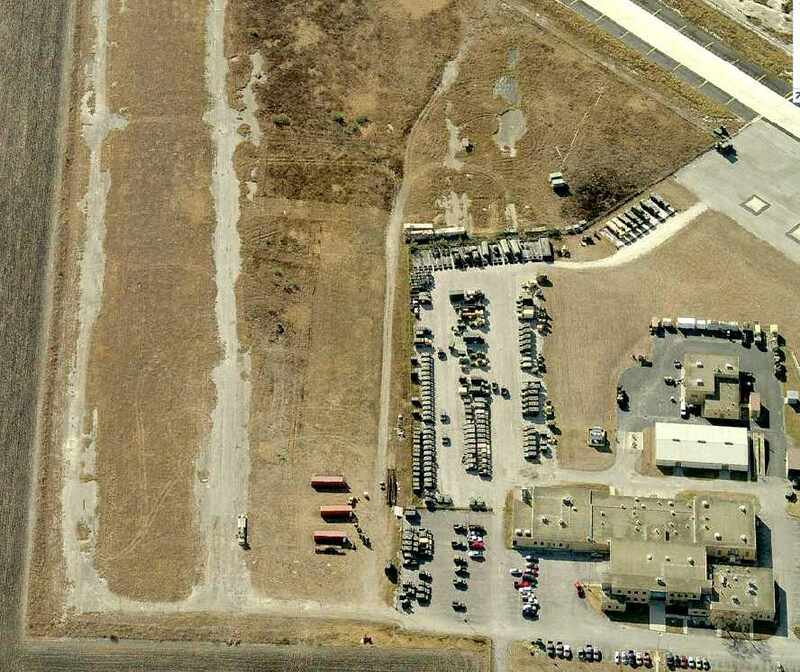 depicted Cuero Municipal Airport as a rectangular grass area with a paved ramp & several buildings on the west side. and indicated that Army flight operations were conducted from the field. showing hangars, the ramp, and dozens of trainer aircraft. A circa 1944 photo (courtesy of Brian Copher) showing AT-6 Texans & Fairchild PT-19s inside a Cuero hangar. 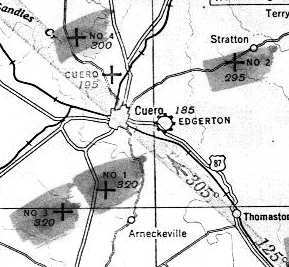 Flight training operations at Cuero Field were discontinued on 8/31/44. and Clyde Brayton moved to Houston to become president of Red Arrow Freight Lines. along with 4 satellite airfields (simply labeled "No 1", "No 2", "No 3", and "No 4"). as a 501 acre rectangular property having a sod all-way landing field, measuring 5,900' north/south by 3,400' east/west. 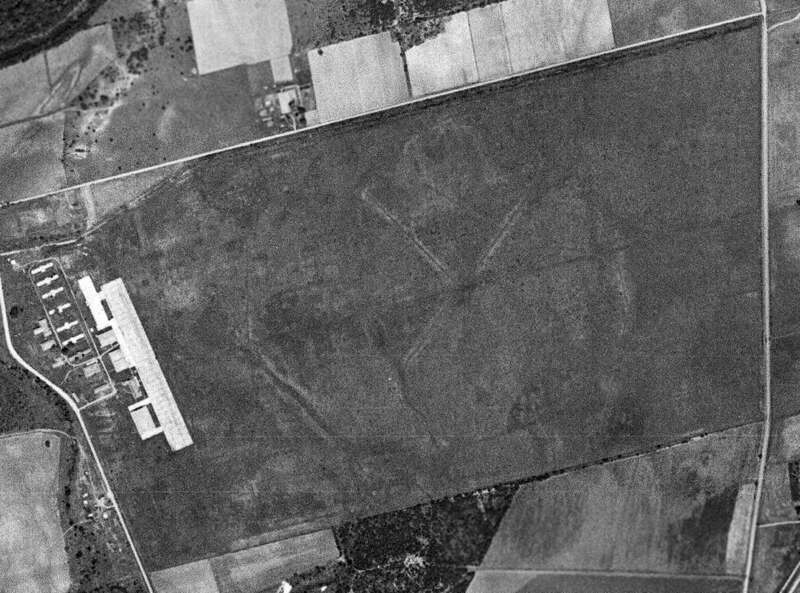 The field was said to have 4 hangars, the largest being a 431' x 109' metal structure – remarkably large for the time. 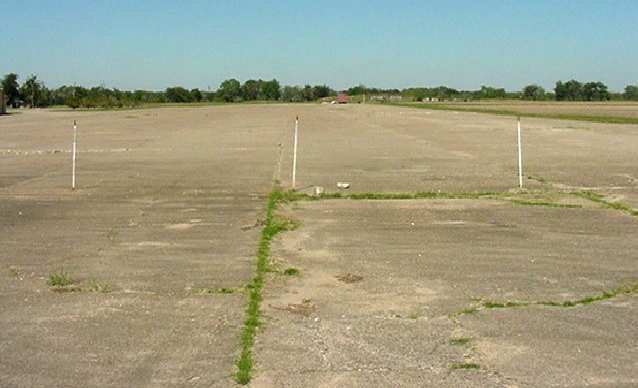 The airport was said to be owned by the City of Cuero, and operated by private interests. showing a large number of trainer aircraft presumably in storage after the closure of the wartime flight training operation. for a crop dusting service based in Portland TX. mostly trainers, such as the Beech AT-7, AT-10, AT-11, the Curtis AT-9, and Cessna UC-78s. There were 2 hangars there being used. 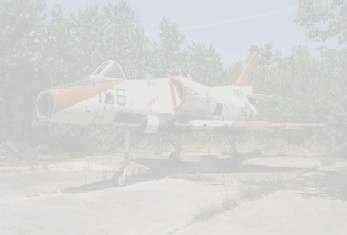 One hangar was being used to strip instruments & equipment from the AT-9s & AT-10s. Those airplanes (AT-9 & AT-10) were then moved to the adjacent hangar, cut up & destroyed. and described as having a 5,300' unpaved runway. 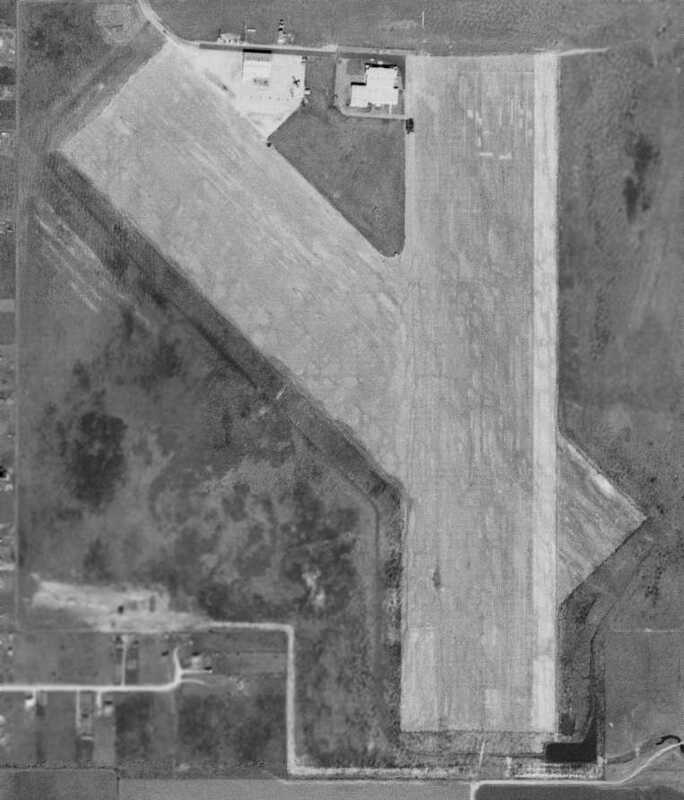 A 4/16/53 USGS aerial view depicted Cuero Municipal Airport as a rectangular grass area with a paved ramp & several buildings on the west side. 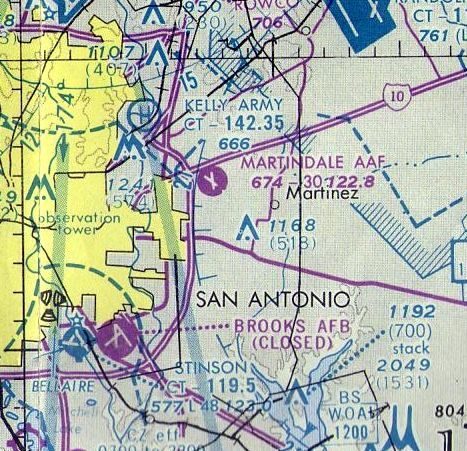 as it was not listed among active airfields in the 1963 TX Airport Directory (courtesy of Steve Cruse). 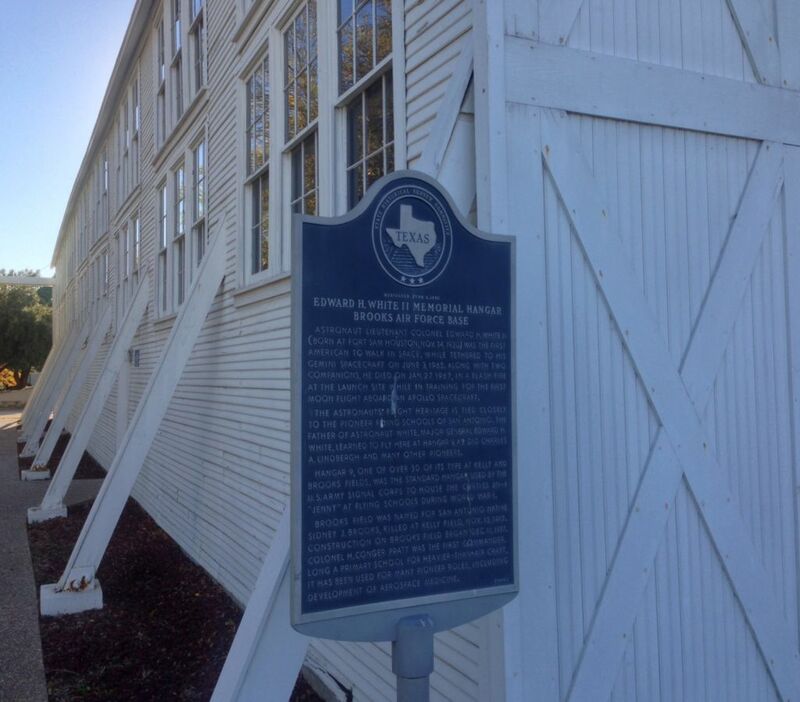 which was built 2 miles east of the town of Cuero. 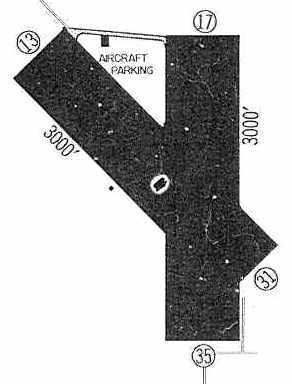 the 1981 USGS topo map still depicted a section of a single northwest/southeast runway, labeled "Landing Strip". 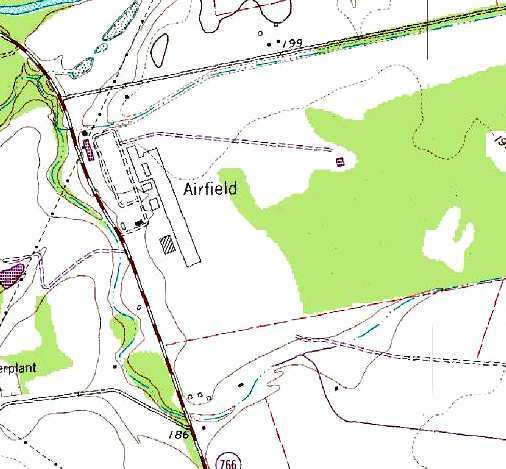 The 1987 USGS topo map labeled the site simply as "Airfield", and depicted the paved ramp & buildings. 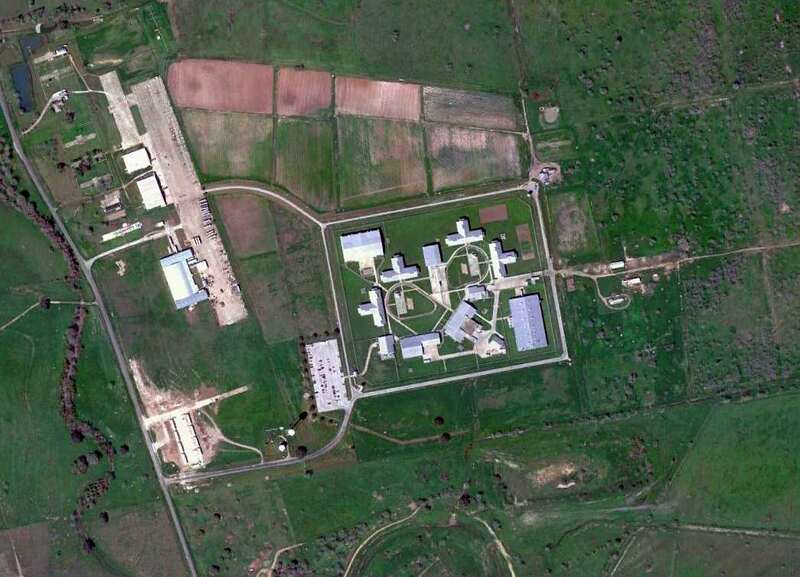 In 1994 the TDCJ Emergency Prison was completed on the center of the former Cuero Field. 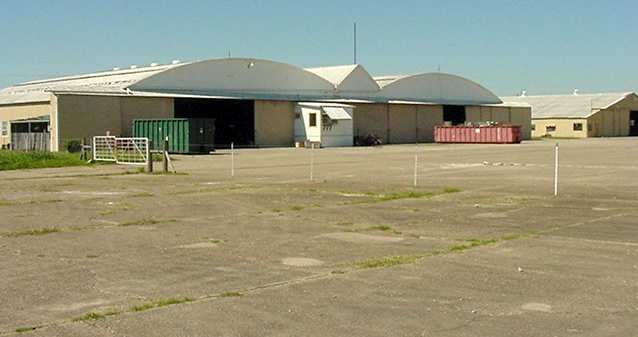 along with several former hangars & other airfield buildings along the west side of the ramp. The newly-constructed prison is seen just southeast of the ramp. 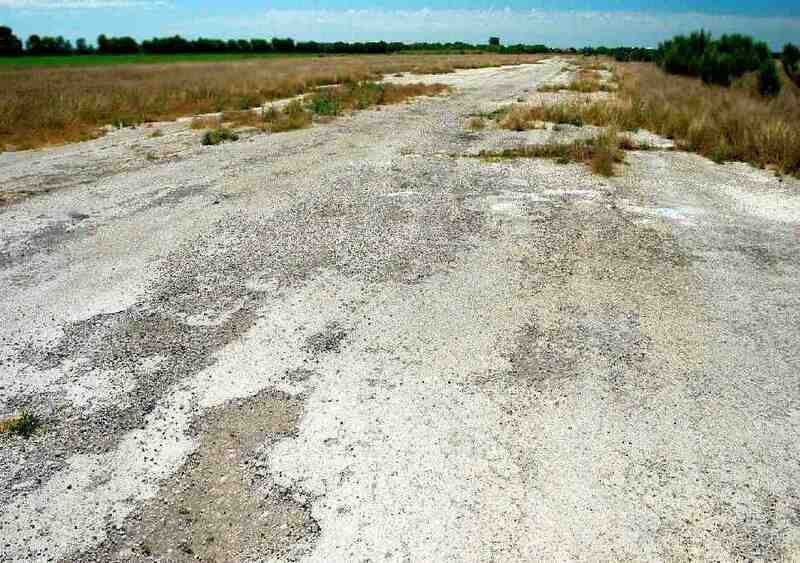 A 2003 photo by Scott Murdock of the remaining ramp at the former Cuero Field. 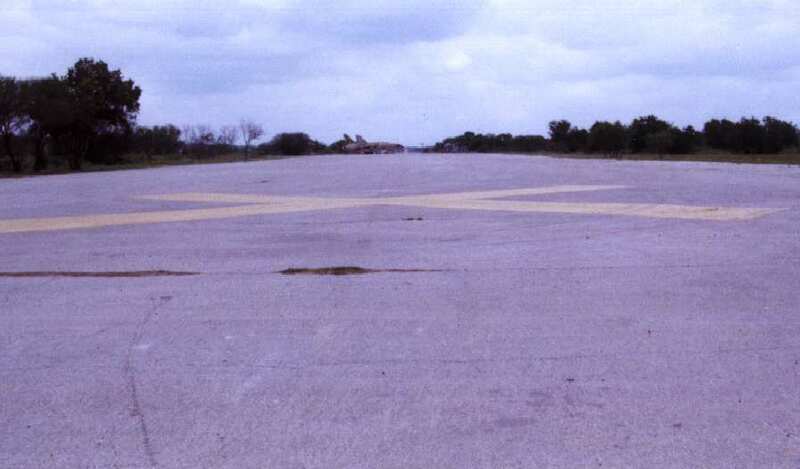 A 2003 photo by Scott Murdock of one of the remaining hangars at the former Cuero Field. 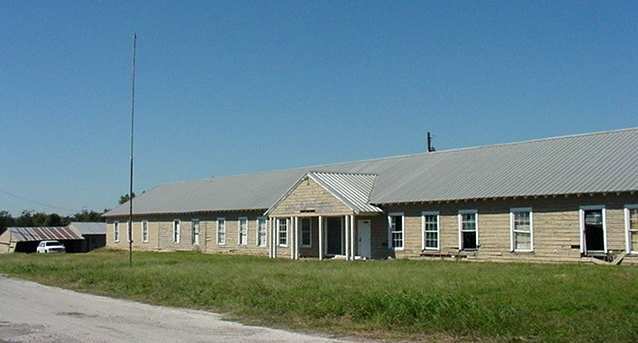 A 2003 photo by Scott Murdock of Cuero Field's former administration building, still with its flagpole. Scott Murdock visited the site of Cuero Field in 2003.
and what I believe was the administration building, complete with flagpole. 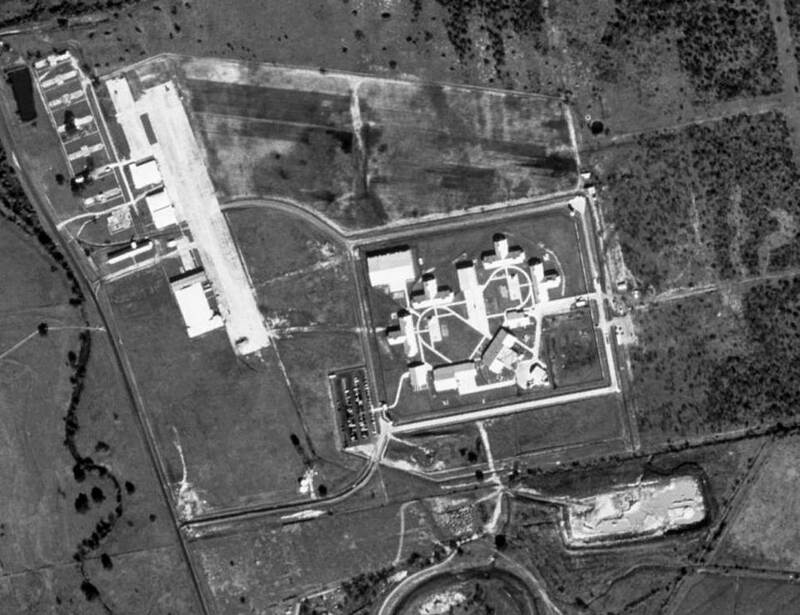 Part of the actual flying field is now occupied by a prison." 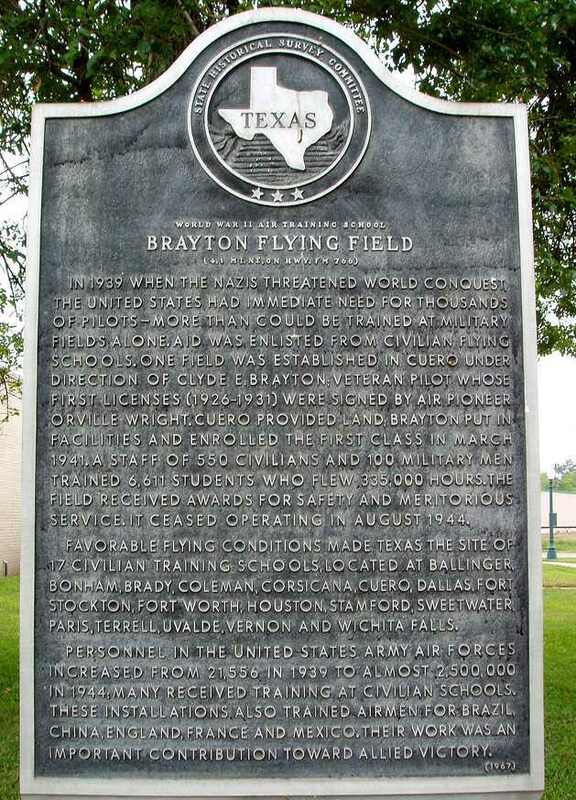 A 4/24/07 photo of a historical marker commemorating Brayton Flying Field. 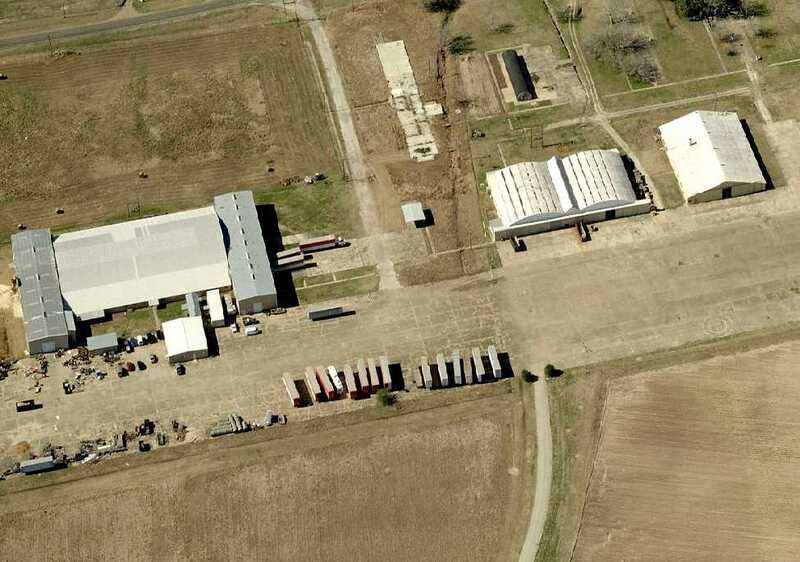 A circa 2010 aerial view looking west at the site of Cuero Field showing the ramp & 4 former hangars remaining intact. 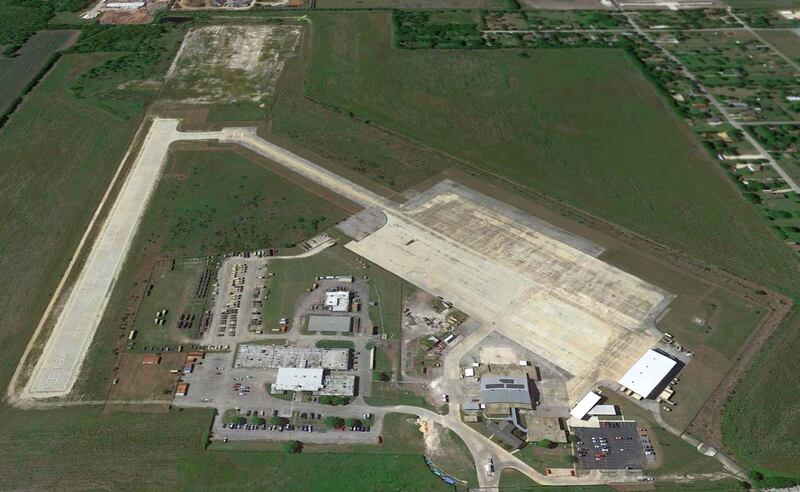 A 3/3/12 aerial photo of the site of Cuero Field showed the ramp & several former hangars remained intact. 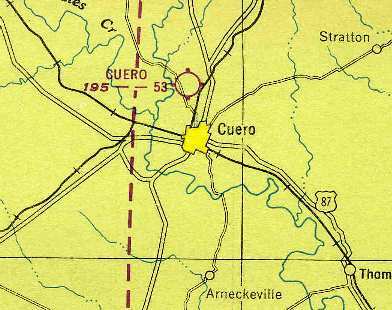 The site of Cuero Field is located southeast of the intersection of Route 766 & Blackwell Road. from the 1945 AAF Airfield Directory (courtesy of Scott Murdock). 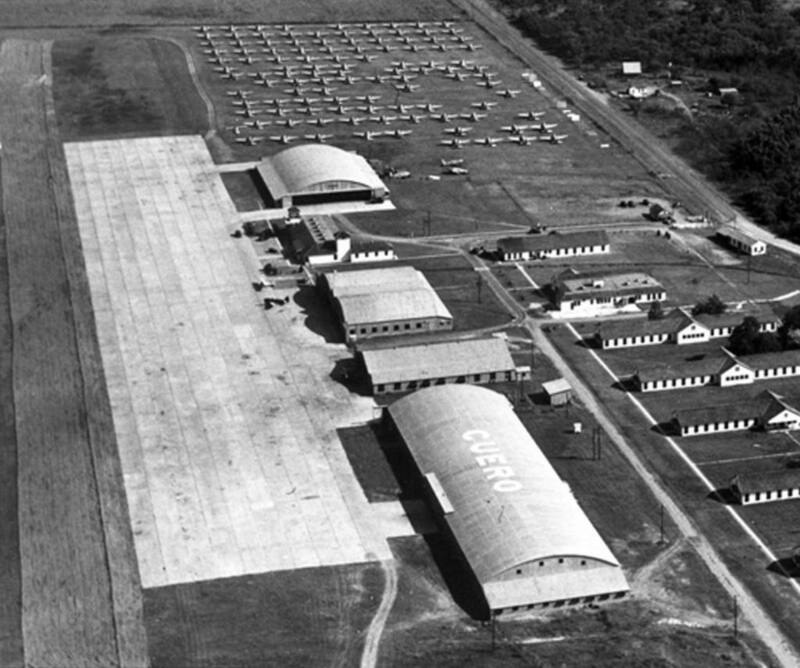 which was the largest flight training facility in the world at the start of WW2. as it was not yet depicted on the 1943 San Antonio Sectional Chart (according to Chris Kennedy). It depicted Martindale as having 2 paved runways. as a 270 rectangular property having 2 paved 3,000' runways, oriented north/south & northwest/southeast. The field was not said to have any hangars, to be owned by the U.S. Government, and operated by the Army Air Forces. 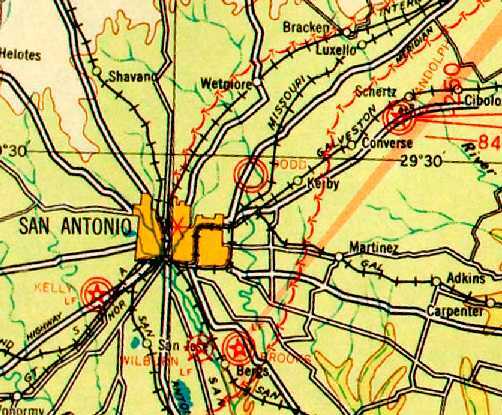 was on the 1945 San Antonio Sectional Chart (courtesy of Chris Kennedy). as having a 3,000' hard-surface runway. 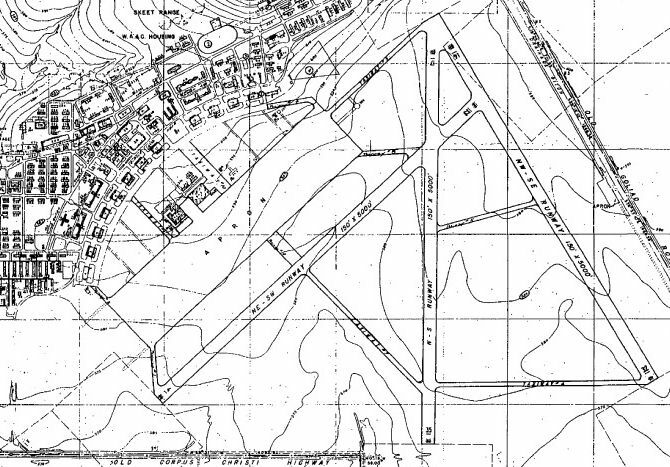 The 1953 USGS topo map depicted "Martindale National Guard Airfield" as having 2 (very wide) paved runways. as having 2 (very wide) 3,000' paved runways: 13/31 & 17/35. 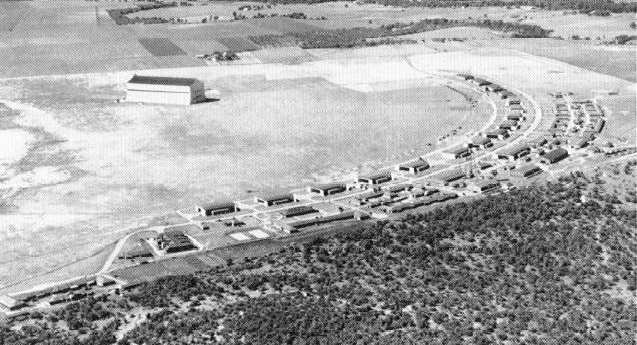 A 2/1/63 aerial photo showed Martindale to have 2 wide paved runways, with a ramp, hangar, and a single aircraft on the north side. and depicted as having 2 paved runways, with the longest being 3,000'. depicted Martindale AAF as having 2 paved runways. 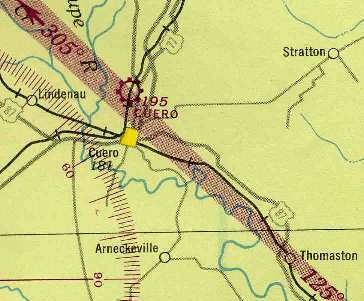 as it was labeled as an abandoned airfield on the 1983 USGS topo map. by the Texas Army National Guard for helicopter operations. 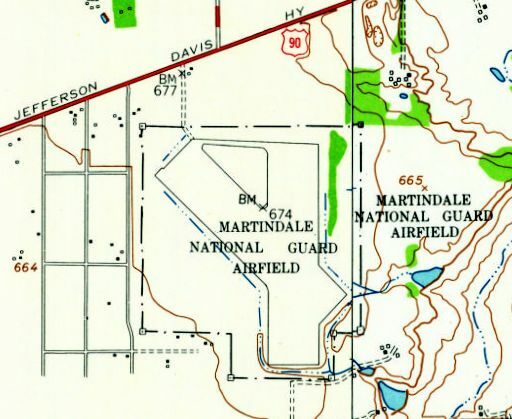 It was labeled "Martindale Army Airfield (National Guard)" on the 1992 USGS topo map. A 1995 USGS aerial view looking south showed Martindale AAF's runways in extremely poor condition. 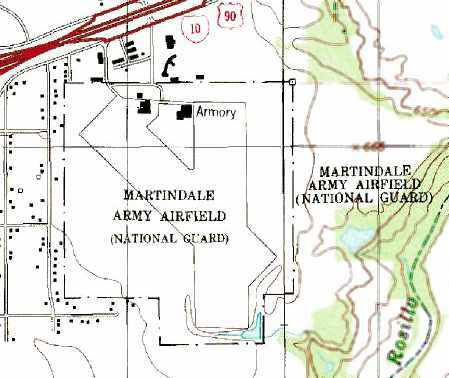 As of 2003, Martindale was still listed as an active military airfield in the Airfield Facility Directory. An April 2005 photo by Josh Ream looking south from Martindale's approach end of Runway 17.
showing several TX NG UH-60 Blackhawks. A circa 2006 aerial view looking south, with the remains of Martindale's former Runway 17/35 on the left. A 1/29/08 photo by Jerry Gunner of a Sikorsky UH-60A (88-26055) of the TX ArNG Company 'C' / 2-149th Aviation (AA) at Martindale AAF. 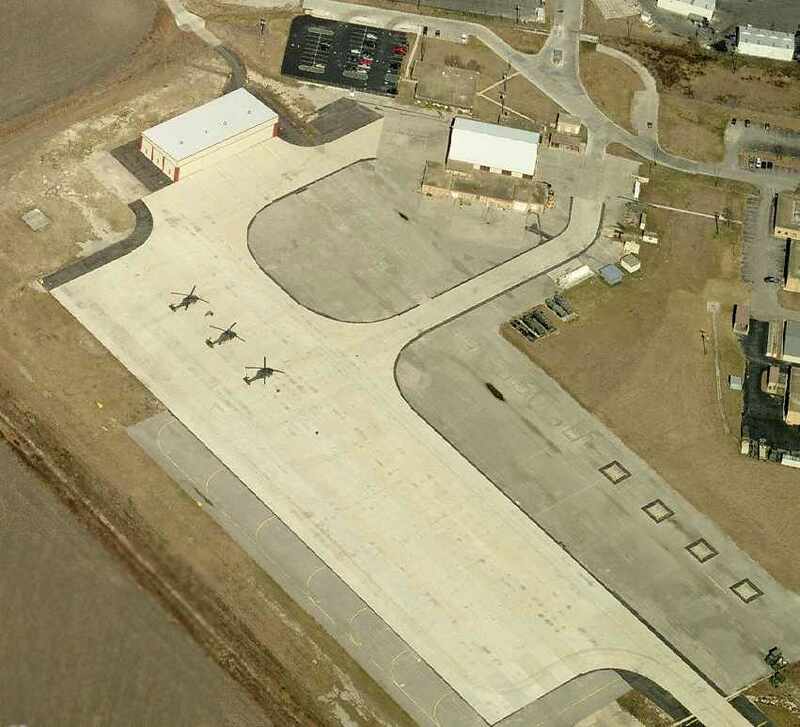 with multiple new helicopter pads having been built over the northern portion of the former Runway 13/31. 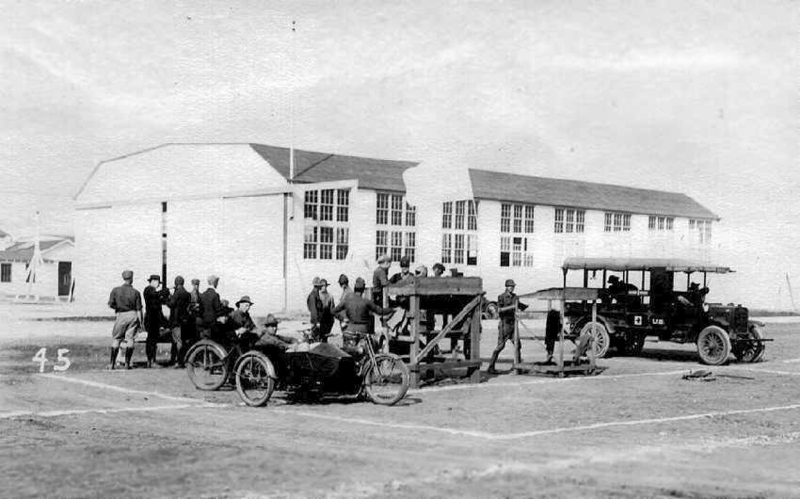 A circa 1918 photo of a hangar at Brooks Field (from the Fort Sam Houston Museum, courtesy of David Brooks). This field was established in 1917 as Gosport Field, a facility to train flight instructors. It was renamed Brooks Field in 1918. 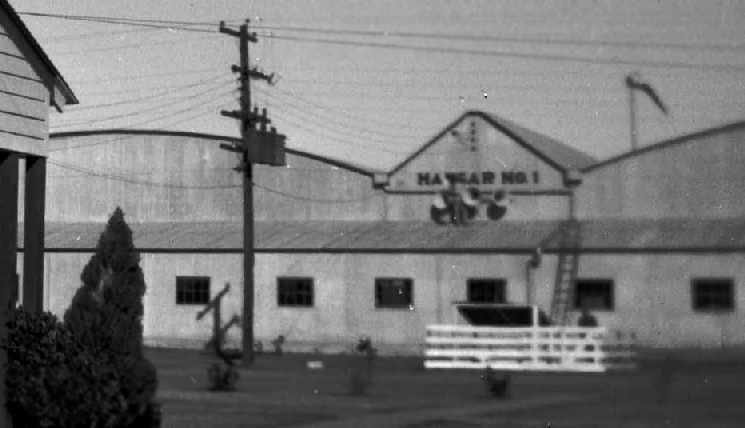 Hangar 9 was built during this period. In 1919 the army replaced the pilot school with a balloon & airship school. 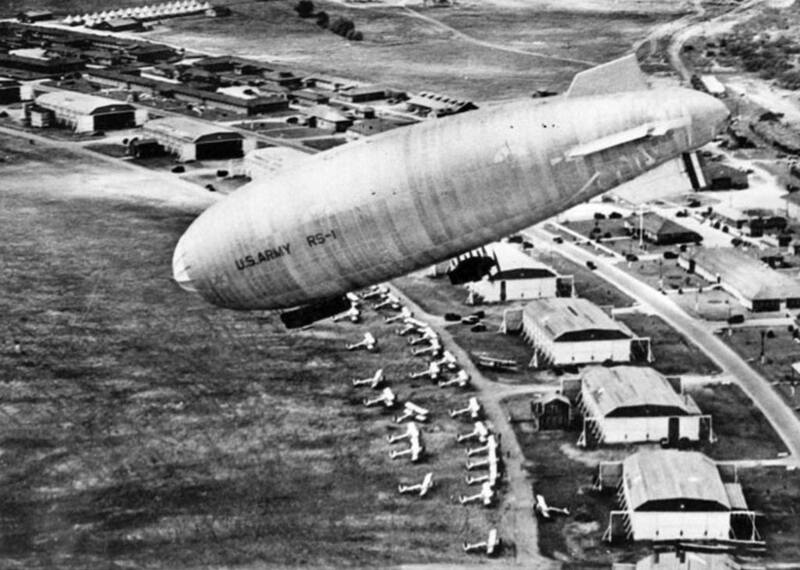 A 1921 aerial view looking southwest at U.S. Army rigid airship RS-1 flying over Brooks Field. 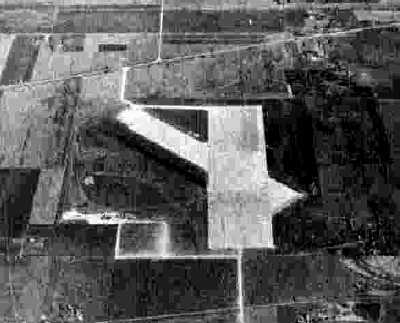 A 1922 aerial view looking southwest at the arc of 16 hangars at Brooks Field. 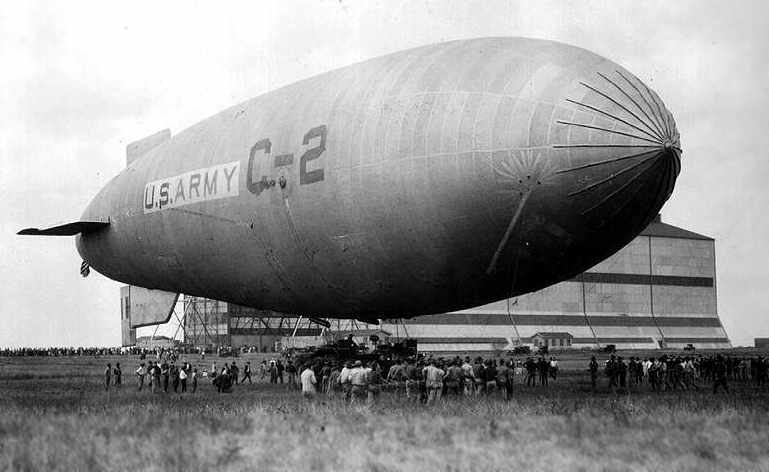 A 1922 photo of the C-2 blimp at Brooks Field (from the Fort Sam Houston Museum, courtesy of David Brooks). 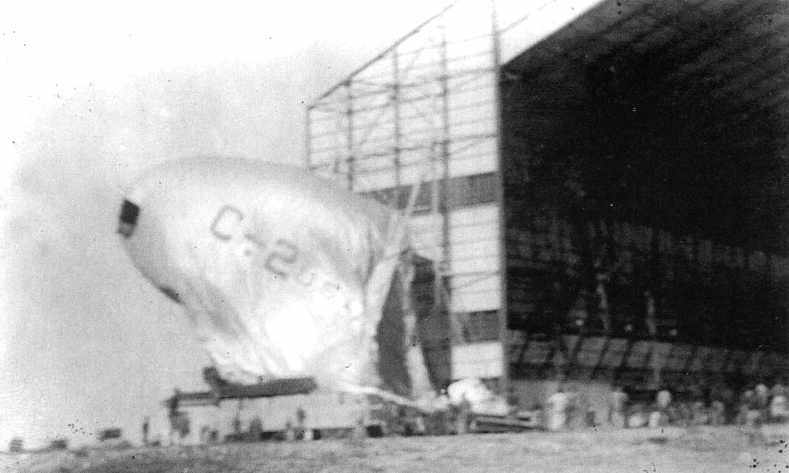 A 1922 photo of the C-2 blimp after it had been blown back against the hangar (from the Fort Sam Houston Museum, courtesy of David Brooks). The caption on the back of the photo says it burned & was the last time the Army used hydrogen filled LTA craft [thereafter they used helium]. Following a series of accidents, the army closed the balloon & airship school in 1922. From 1922-1931 Brooks served as the primary flying school for the Army Air Corps. An undated photo of dozens of unidentified biplanes at Brooks Field (courtesy of Rex Ricks). 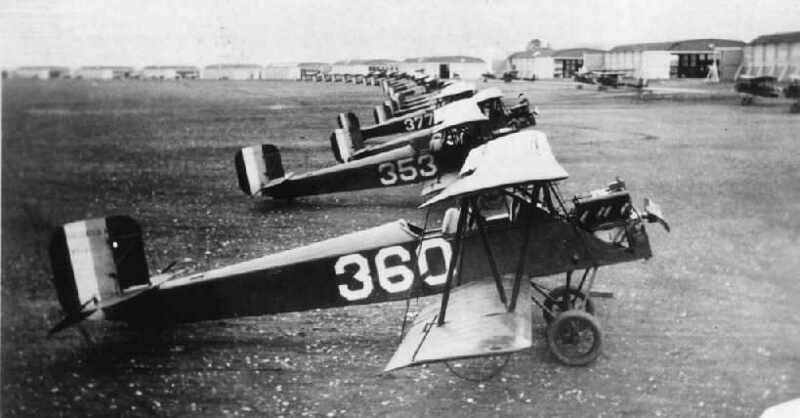 A 1923 photo of a row of PT-1s in front of the hangars at Brooks Field (from the Fort Sam Houston Museum, courtesy of David Brooks). and a dirigible hangar in the center of the grass airfield area. 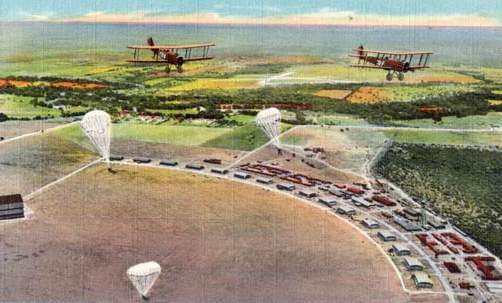 A colorized circa 1920s-1930s Army Air Corps photo looking northwest at Brooks AAF. 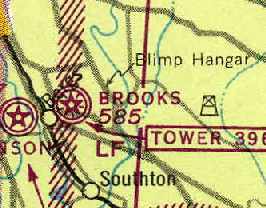 In 1929, Brooks was the site for the first successful mass parachute drop in the world. confirmed the practicality of tactical paratrooper warfare. 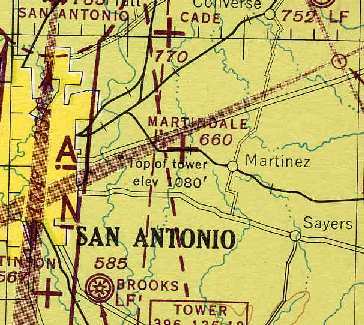 Brooks Field, as depicted on the 1929 Beaumont – San Antonio Airway Map # 27 (courtesy of David Brooks). Brooks Field, as depicted on the 1934 San Antonio Sectional Chart. and several units were trained in tactical observation. 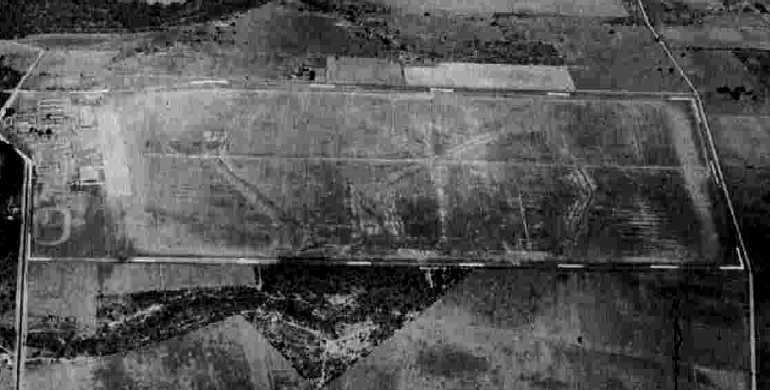 showing the addition of 3 paved runways in the center of the airfield. In 1940, Brooks became the site for a special school for combat observers. with emphasis on aerial observation skills. described Brooks Field as having 3 concrete runways, with the longest being the 5,100' northeast/southwest strip. Yturri Auxiliary, Dilts Auxiliary, Kelley 2 Auxiliary, and Kelly 4 Auxiliary. when Brooks became the home for training pilots in the new B-25 bomber. This remained the mission of the base for the rest of World War II. 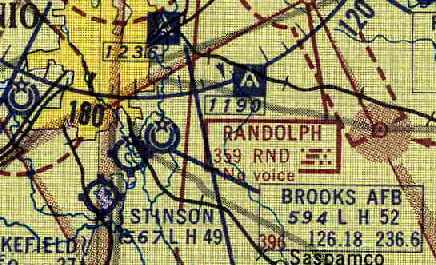 Brooks AAF, as depicted on the June 1943 San Antonio Sectional Chart (courtesy of Chris Kennedy). and 3 new runways having been built somewhat further to the south. The dirigible hangar had been removed at some point between 1939-45. 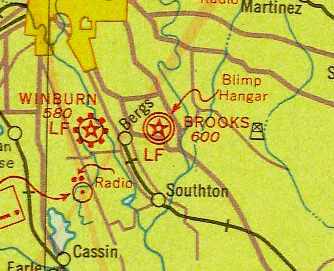 A 1946 map depicted Brooks AAF as having 3 paved runways (courtesy of Rex Ricks). the base took on a new mission. 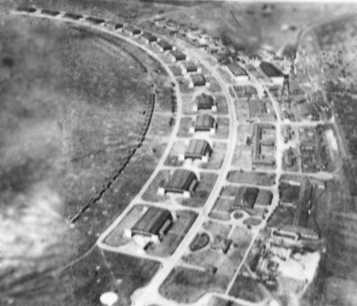 In 1951 in the midst of the Korean War, the Air Force established a reserve training center at Brooks. The 907th Air Reserve Wing was assigned to the base. Conceived originally as a troop carrier unit, the wing did not receive its first planes until the summer of 1952. The planes were T-6 Texans, an indication of the 907th's new mission, pilot training. 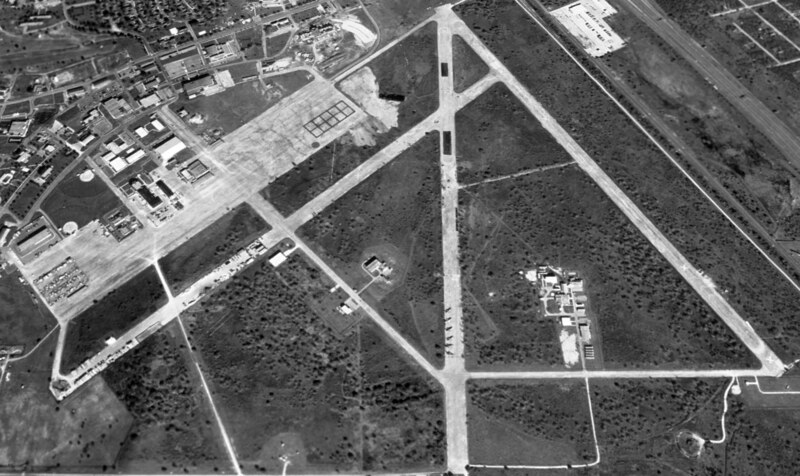 A circa 1952-54 aerial view looking south at the ramp at Brooks AFB (from the Fort Sam Houston Museum, courtesy of David Brooks). the 907th Air Reserve Wing was replaced by the 8707th Pilot Training Wing (Single-Engine). On the first anniversary of its activation, the 8707th had 6 T-6s & 2 C-46 Commandos assigned. That began to change in April 1953 when the wing acquired its first five North American T-28s. 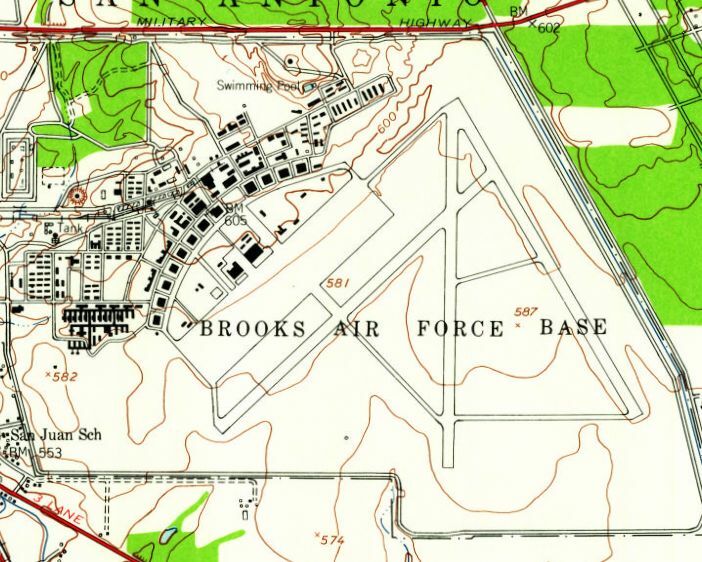 The 1953 USGS topo map depicted Brooks AAF as having 3 paved runways. took over the 8707th Pilot Training Wing's pilot training program. At year's end the wing converted to C-46s & the 8707th was replaced by the 433d Troop Carrier Wing. with the arrival of another aircraft, the C-119 transport. Four years later, the 433rd Troop Carrier Wing moved to Kelly AFB. whatever the numerical designation, the people of San Antonio have always referred to the unit as the Alamo Wing. as having a 5,200' hard-surface runway. for medical research, development, and education. An era in aviation history ended in 1960, when the last plane took off from Brooks. commander of Det. 1, 1st Aeromedical Transport Group. 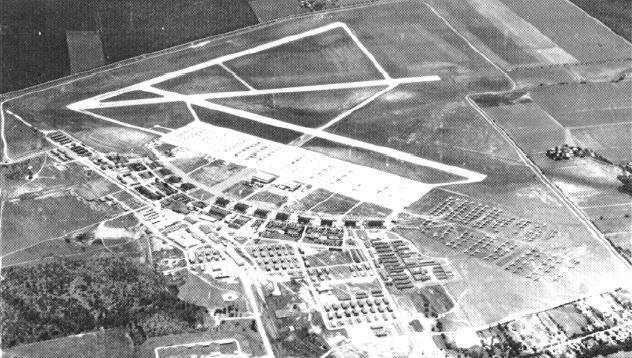 A 2/5/63 aerial photo showed the expansive airfield at Brooks shortly after the closure of its aviation operations. but it was labeled as "Brooks AFB (Closed)". Jack Lewis recalled, “My first duty station was Brooks Field. I was with the 6906th Electronic Security Squadron on the back side of the base. I was one of the 2.5 ton truck driving instructions & we used the runway (closed) at Brooks for drivers' training. Brooks also had an electronically monitored little building about 25 - 30 yards from our building. and rumor had it that Moon rocks and other 'off-world' stuff was stored there. It had a fence with vibration sensors around it. it would scare several of the ever present Jack Rabbits out of their holes, and they would run in all directions. which caused the Security Police to scramble a squad car to look for intruders. A 1990 photo by John Voss of at least 2 F-105 Thunderchief fighters at the end of a closed runway at Brooks. and were simply parked there on one of the remote taxiways. There appeared to be about a dozen of them." According to Jack Lewis, “The F-105 Thunderchiefs were used for Battle Damage Repair classes. They brought them in to the base around 1978-79 on flatbed trucks, and parked them where they still sit. then practice patching them with aluminum cans & rivets. They also taught the fine art of 'duct taping' the holes as an expedient repair method to get the aircraft back into combat ASAP. 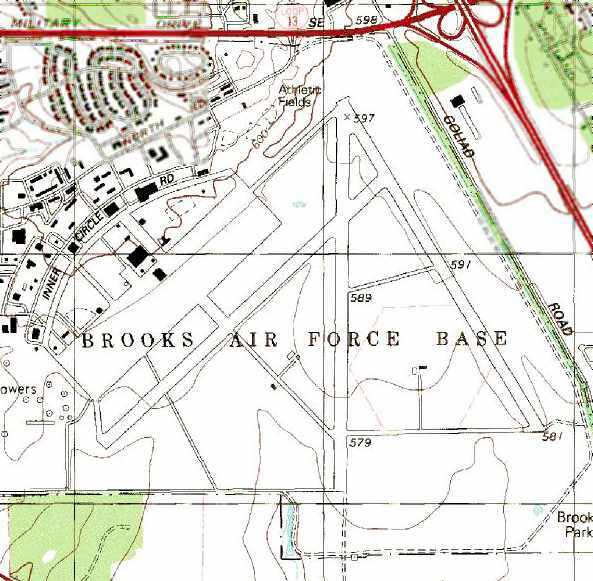 The 1992 USGS topo map depicted the multiple runways, taxiways, ramps, and hangars of Brooks AFB. A 1994 photo by Scott Murdock of Hangar 9.
and is a national historic landmark. 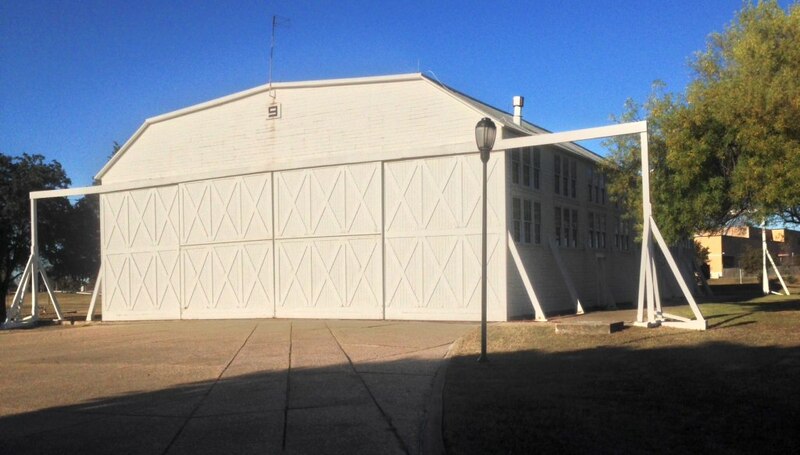 It is reputedly the oldest existing former USAAF hangar. 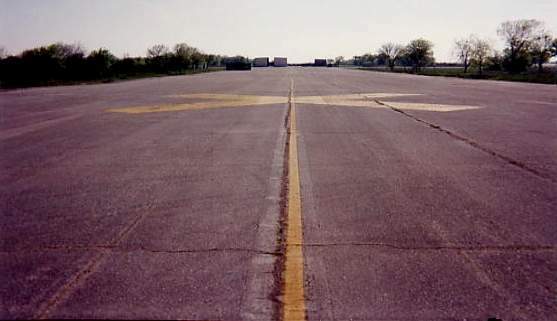 A 1994 photo by Scott Murdock of a closed runway at Brooks AFB. 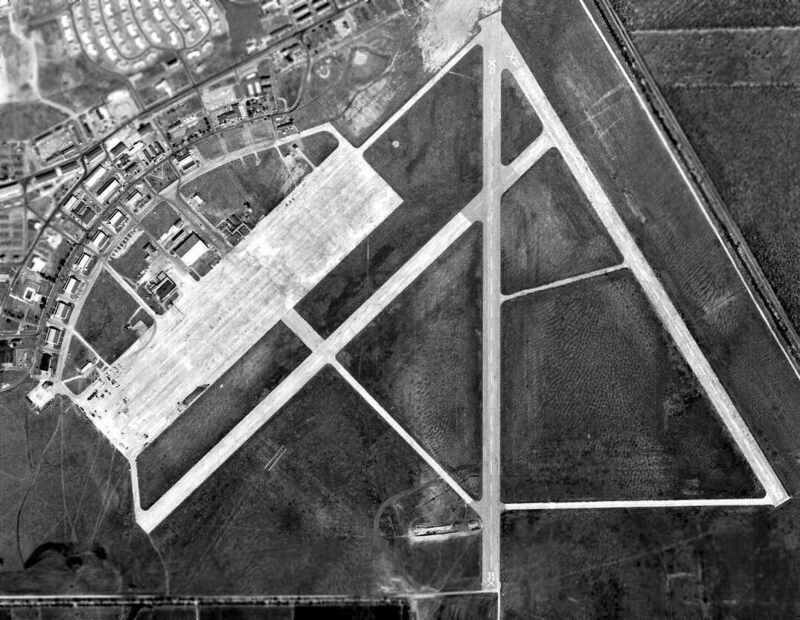 A 1995 USGS aerial view looking north at the abandoned runways of Brooks AFB. 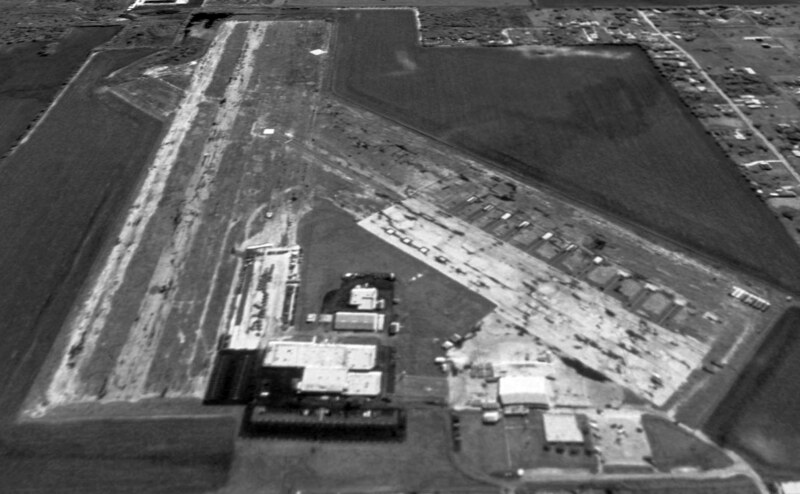 Note at the bottom-center, the 6 F-105 Thunderchief fighters parked on the south end of the abandoned Runway 35. 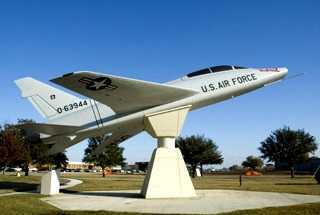 In 1999, Congress authorized the Secretary of the Air Force to implement a Base Efficiency Project at Brooks AFB. with the City then leasing back land & facilities to the Air Force for its missions. It is known under that new arrangement as Brooks City-Base. for communities hoping to minimize the negative economic impact of base closures and realignments. at the fledgling Brooks Development Authority, the entity that operates the city base. that are scattered & duplicated among the service branches. or risk losing the prestigious 311th Human Systems Wing & other military entities as the chief tenants. never to be reused for aviation. This was described in an article entitled "Runways at Brooks seeing final 'takeoff'"
and dumps them on a growing pile of rubble. as crews peel back the three, mile-long runways that have served the former Brooks AFB - now Brooks City-Base - since the 1940s. Long gone are the military jets and planes that used to roll across this pavement. continues to sell & lease land around the Air Force research facility." motioning to a wide expanse of concrete that seems to stretch to the horizon." will remove the unneeded concrete to make room for the further development of Brooks City-Base. into a high-tech research park with a new commercial corner that cuts into the runways. But the 140,000 tons of concrete & asphalt won't go far. M&M Contracting has imported a 55-ton crusher to turn the beefy slabs back into usable construction material. The company is going to stockpile the crushed matter on site for future construction projects. a 570,000-square-foot commercial development that includes a Wal-Mart Supercenter, Office Depot, Chili's, Starbucks and Broadway Bank. If not, the material probably will be used as the foundation for new roads as the 1,300-acre City-Base is developed." 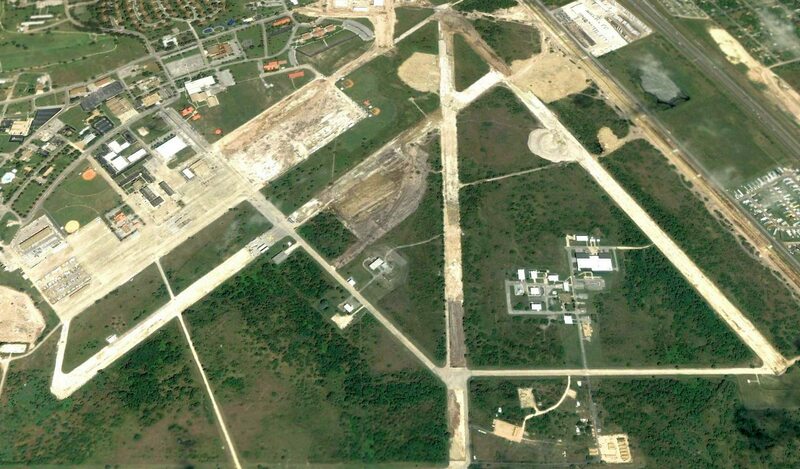 A 2005 aerial view looking north at the abandoned runways of Brooks AFB, before they were completely removed. thereby bringing to an end almost a century of military use of Brooks Field. 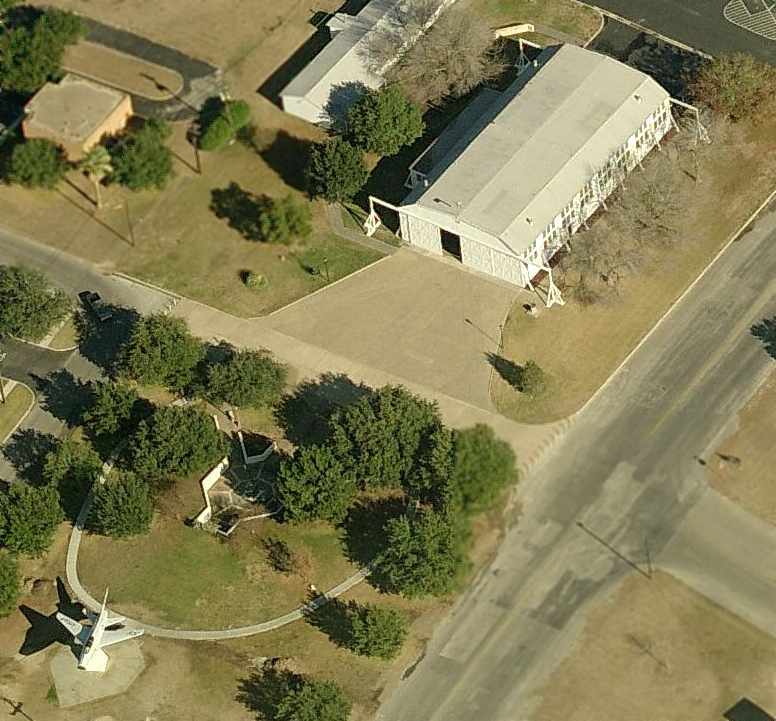 Scott Beadle reported in 2005, “I have been flying around San Antonio a lot lately. I take my students to Stinson Field to practice touch & go's. The pattern there take me right over Brooks. I can report that the runways have all been torn up. The main ramp is still intact & is being used as a large parking lot. along with an F-100 Super Saber mounted on a pylon at the bottom of the photo. A circa 2000-2009 photo of a F-100F, dubbed “Weightless 2”, mounted on a pylon in front of Brooks' Hangar 9.
to explore problems associated with weightlessness during flights staged at Edwards & Kelly AFBs. A February 2014 photo by Mark Jenkins (courtesy of Dan MacPherson) of the historic sign in front of Brooks' Hangar 9. A February 2014 photo by Mark Jenkins (courtesy of Dan MacPherson) of Brooks' historic Hangar 9. The Handbook of TX Online.